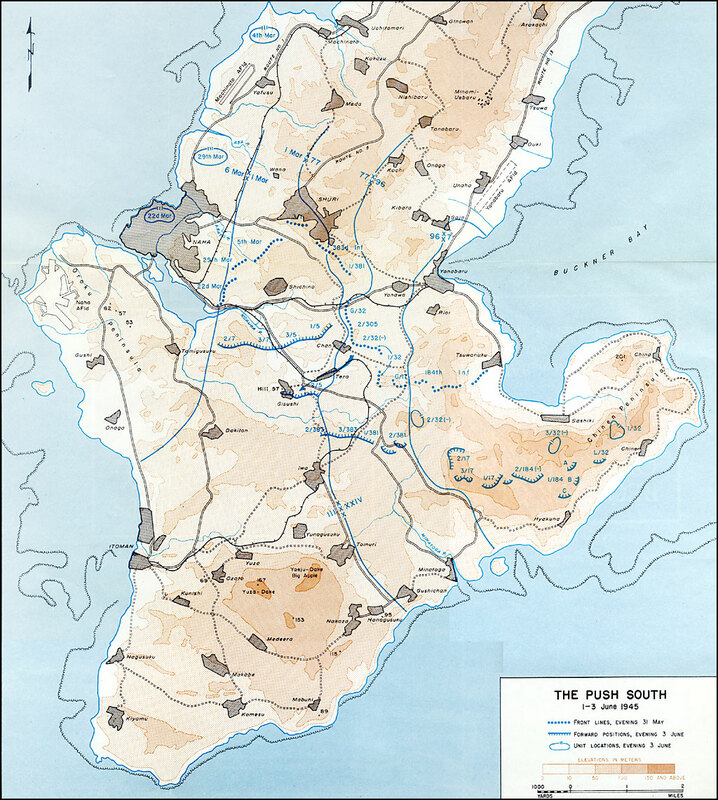 Upon receiving the word to advance, Marines go over the top in assault on Jap hill. 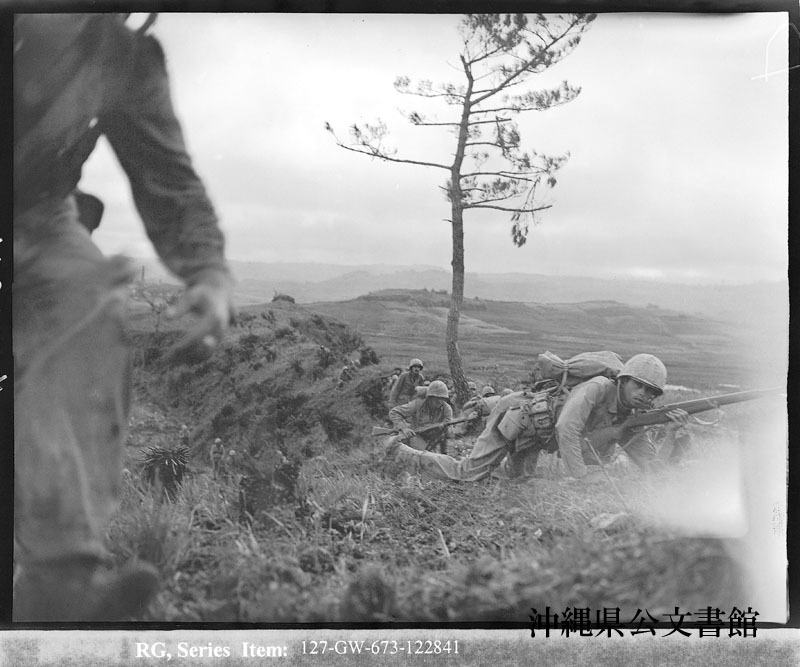 Marines are going over the top in advance on a Jap hill. 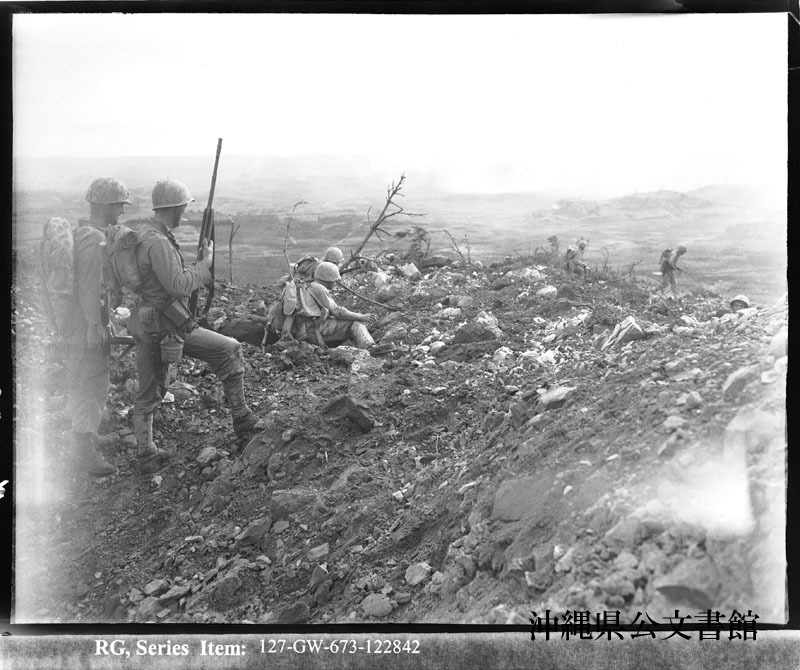 This action is taking place on very front lines as Marines advance under fire of Jap soldier. 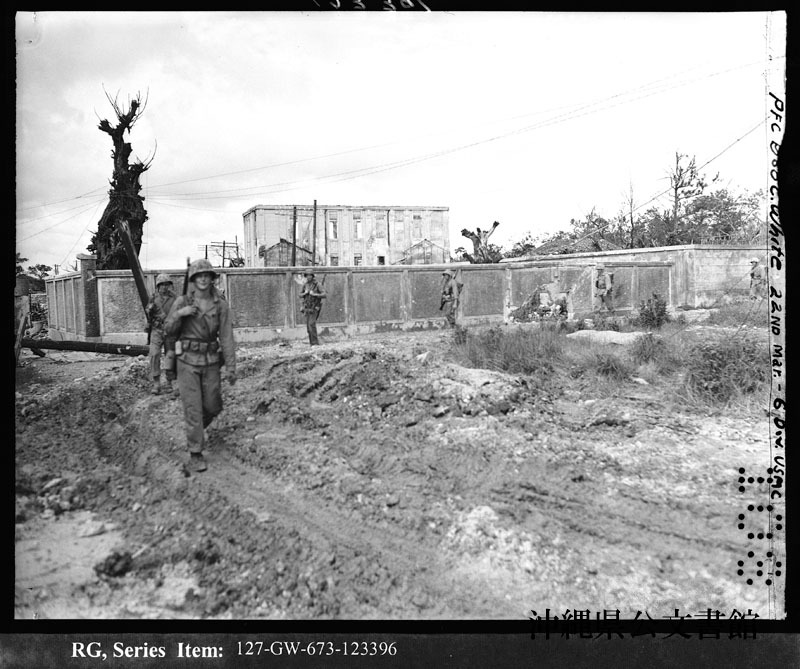 Troops moving up road in Naha. A view to the northeast from the high ground along the northern fringe of Oroku Peninsula. 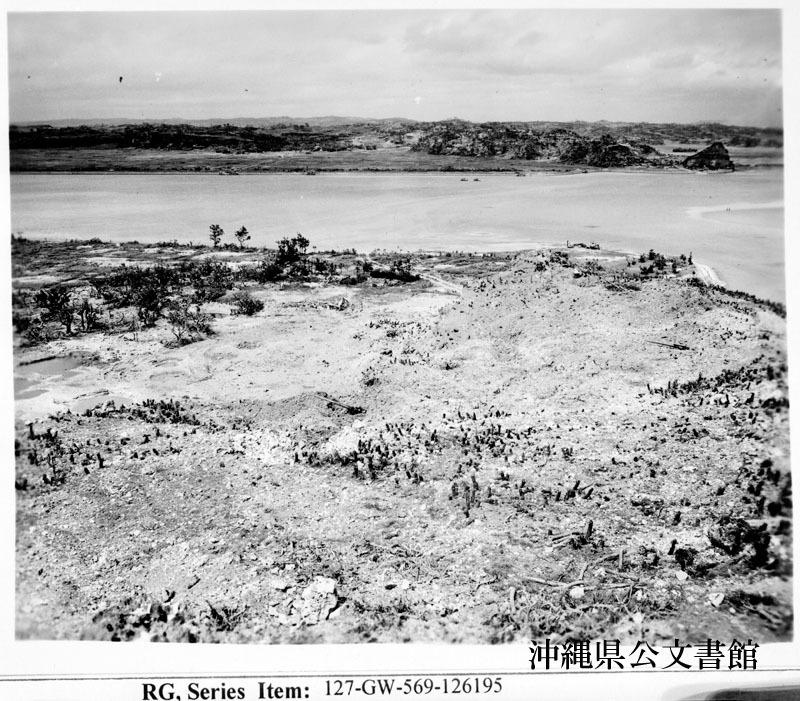 It was from this high ground that the enemy watched the Sixth Marine Division move through Naha and down to the Kokuba Gawa. 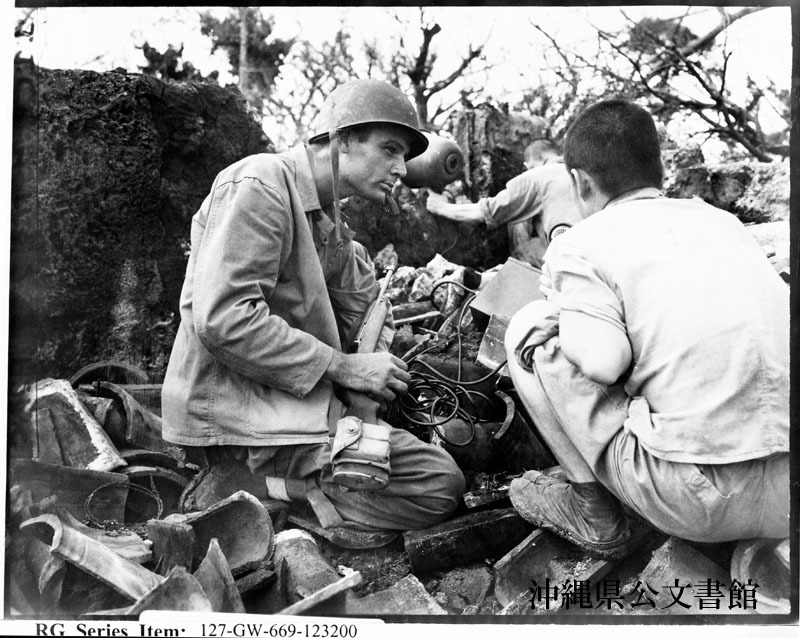 While the prisoner in the background holds a loudspeaker over his head, First Lieutenant Frederick H. Van Brunt, of 1141 Mountain Avenue, Los Angeles, Calif. Who lived 17 years in Japan, listens carefully to the words of the second prisoner who is asking his former comrades to surrender. 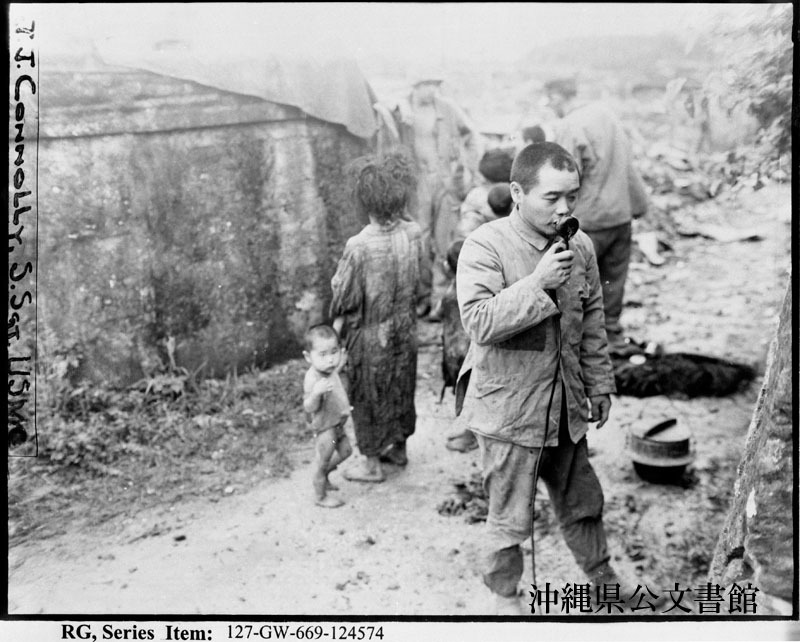 A Japanese prisoner addresses his former comrades over a loudspeaker, asking them to surrender. 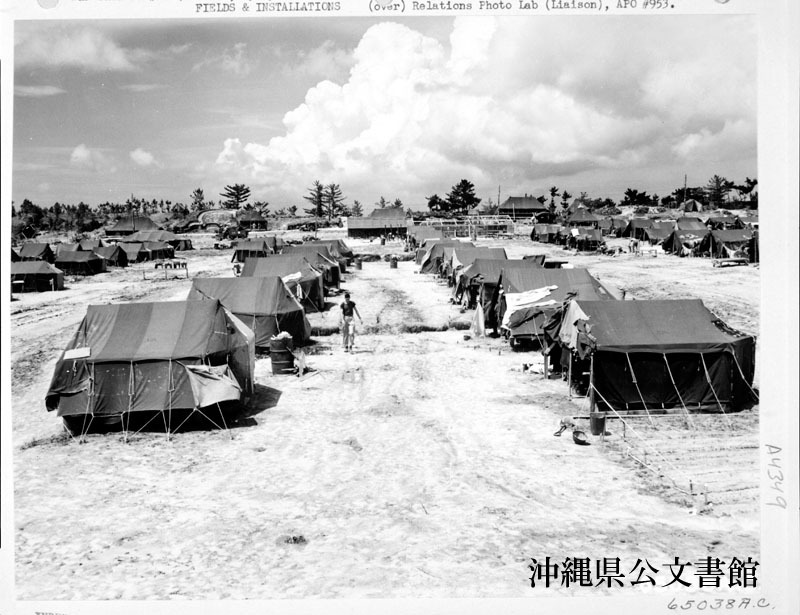 General view of camp area of 1878th Engineer Aviation Battalion on Okinawa, Ryukyu Retto. 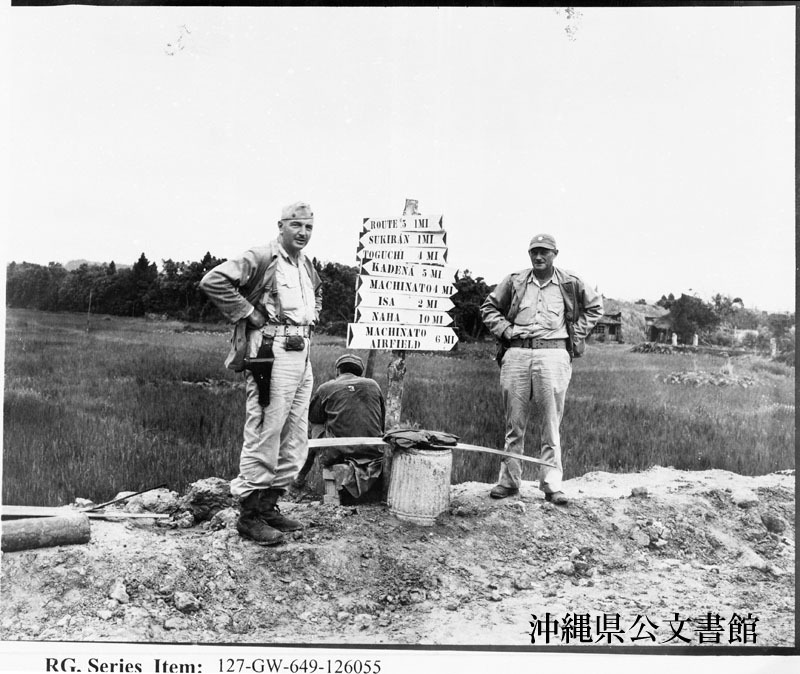 OKINAWAN ROAD SIGN--Two Seabees who served for many months at a camp near Honolulu, are shown here on one of the roads they are now building into recently captured Naha. 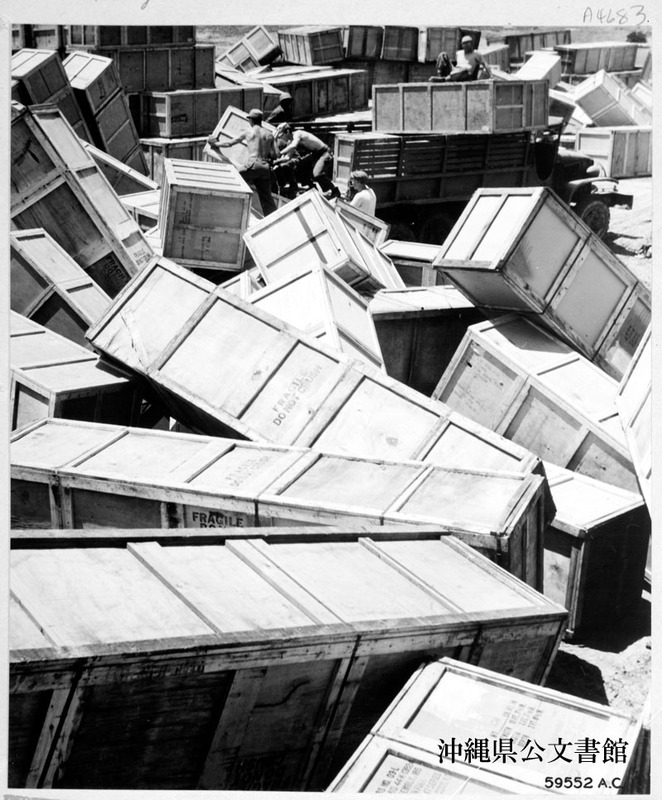 Thousands of long oblong wooden boxes being stacked up at this 7th AAF fighter plane base in the Okinawans might well be coffins for the Japs. 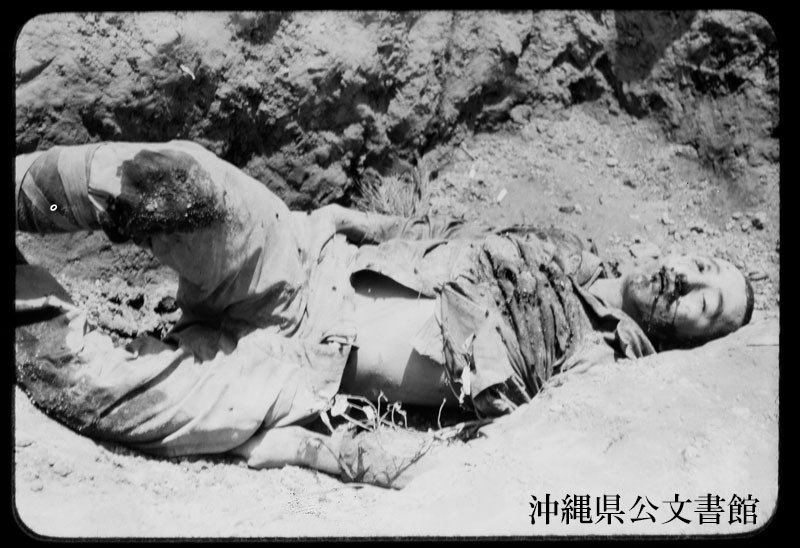 They are crated wing tanks for famous Thunderbolt fighters which will range the Jap homeland at will, destroy every target in sight just as AAF fighters did in Europe. 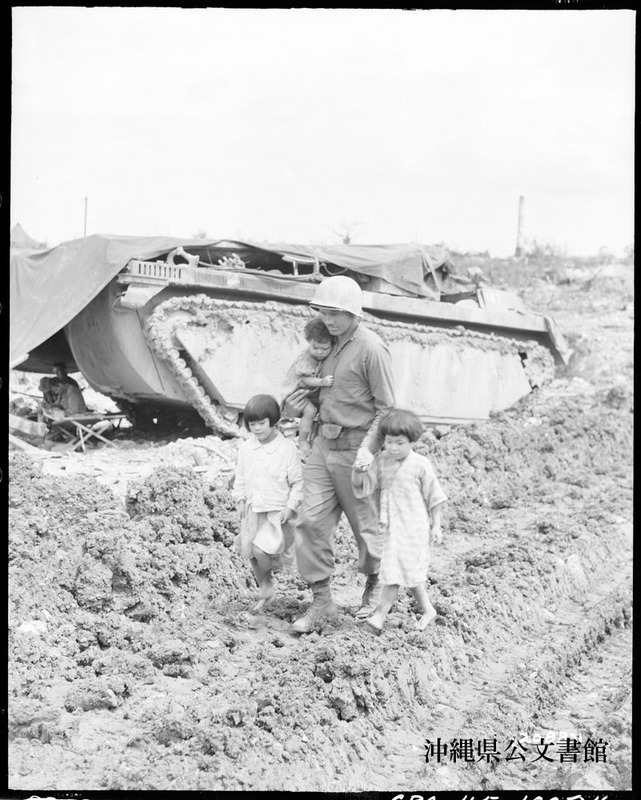 Leading Jap children to safety behind American lines. 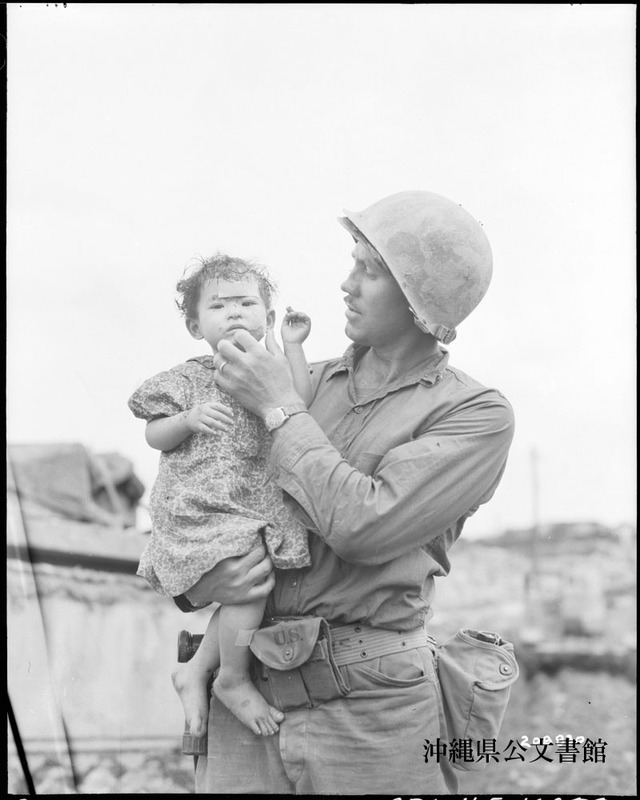 First aid to Jap child.